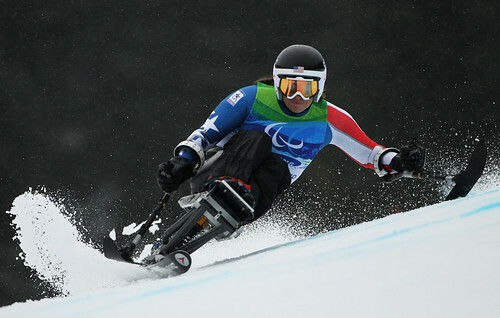 Laurie Stephens of USA makes a run in the Women’s Sitting Giant Slalom during Day 5 of the 2010 Winter Paralympics on March 16, 2010. A Sydney cabbie is in the doghouse after refusing to allow a guide dog and its high-profile owner – Disability Discrimination Commissioner Graeme Innes – into his vehicle. James Young could not have picked a worse person to turn away than Mr Innes, who is a lawyer and human rights advocate. He promptly reported the cabbie to the Department for Transport, which launched a prosecution. Today, Young was fined $750 and ordered to pay $2500 in costs at a Sydney court. When asked to provide his cab number, Mr Young gave five digits instead of four, which Mr Innes knew to be a false number, the court heard. Mr Innes then reported the cabbie to the Department of Transport, which launched the prosecution. Mr Young denied the allegations, telling the court he had no problem with the animal and had been unable to move his cab as it was blocked by other taxis. Ms Huber found that Mr Young had discriminated against Mr Innes and disagreed with the suggestion made by Mr Young’s counsel, Craig Bolger, that no harm had been caused. I’ll try not to sound too fan-girlish here as I write about the documentary Scrambled: A Journey through PCOS by Randi Cecchine, but admittedly, it is a difficult task. For in this film, which chronicles Cecchine’s struggle with Polycystic Ovarian Syndrome, we meet a filmmaker brave enough to show us, wart-hairs and all, the challenges inherent in this disease embodied. She does so with humor, with information, and with space for personal reflection. A.K. Whitney at The Lilith Gaze: RA Diaries: Owww — please don’t touch me! But it’s not just about pain. There is also stiffness and inflammation, and those aren’t always as manageable with drugs. They’re also a bellwether for possible pain to come. Because of that, I’ve never been a very touchy-feely kind of person. By the way is it possible you guys could do an ableist word profile on “tinfoil hat”? That one always manages to offend me. .-= Amanda´s last blog ..Don’t just hand me things. =-. I can’t find the article online, which bothers me, but I have my response on my blog. I could physically feel my anger when I saw that. It was… interesting. And it was fun (in a weird way) to be angry and know the source (the article) and know what I can do (blog, comment, e-mail). I don’t think I’ll comment the person who said that (they used her name, so a quick search in the school directory would give me her e-mail) because she’s a victim of ableist thinking and a freshman, so it wouldn’t be nice. Plus, it’s the paper’s fault for going with that tone.